Scientists from the Smithsonian have a surprising fossil dating about 6 million years old. The fossil seems to have been an ancestor of modern dolphins and might explain why dolphins left rivers and set out for the ocean. 3D printed reconstruction of the dolphin’s head. Image via Smithsonian. Today, there are almost 40 species of dolphins, and all of them are intriguing animals. For starters, all dolphins are marine mammals, which in itself is pretty rare; they evolved from land mammals need to breathe air from the surface and their skeleton is still characteristic of land animals – not fish. The traditional theory of cetacean evolution (whales and dolphins) suggests that this happened sometime around 50 million years ago. But the interesting thing is that they initially lived in rivers, and only started inhabiting the oceans much later. They were also pretty successful from the start. “Fossil evidence suggests that river dolphins’ ancestors were widespread around the globe,” the Smithsonian press release states. I. panamensis was one of these flourishing dolphin ancestors. Today, there are only 4 species of river dolphins, and all of them are endangered… so what happened? Why were they so successful then, and not so much now? Which leads us to this fossil. The fossil, which dates from 5.8–6.1 million years ago, was found on the Caribbean coast near the town of Piña, Panama. It consists of half a skull, lower jaw with an almost entire set of conical teeth, right shoulder blade and two small bones from the dolphin’s flipper. “We discovered this new fossil in marine rocks, and many of the features of its skull and jaws point to it having been a marine inhabitant, like modern oceanic dolphins,” Nicholas D. Pysenson, curator of fossil marine mammals at the Smithsonian’s National Museum of Natural History and the lead author of the study, said in the release. 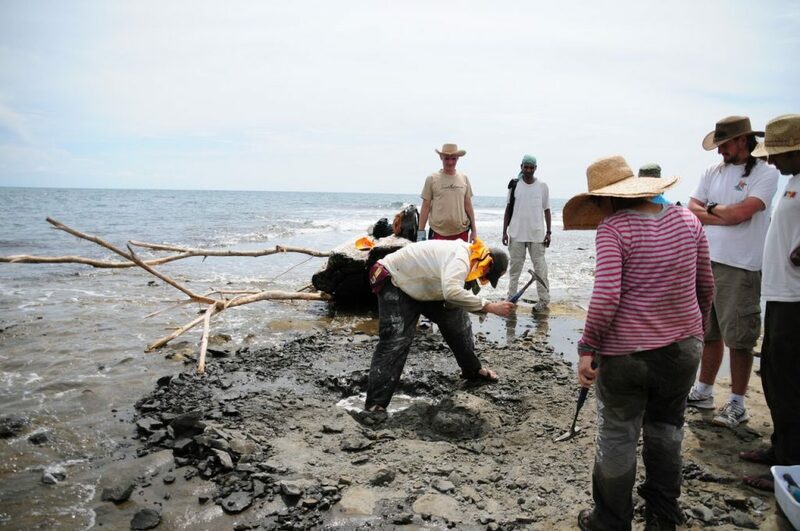 Scientists from the Smithsonian’s National Museum of Natural History and the Smithsonian Tropical Research Institute collect the fossils of Isthminia panamensis, a new fossil dolphin, from the Caribbean coast of Panama on 18 June 2011. The fossil is encased in a white plaster jacket, and recovered as the tide rushed in. This seems to be one of the earliest fossils which shows a marine dolphin, potentially capturing the species in a transition period. Other fossilized animals found at the same site as Isthminia panamensis were marine species, further confirming that I. panamensis lived in a salty, marine environment. Because river dolphins are so threatened now, understanding the environmental constrains which made them leave rivers initially is more important than ever, as it may enable biologists to understand and set up better conservation plans.